The third Saturday of May. I wasn't planning to go home that weekend, but I couldn't resist the temptation of going home again that weekend. I wasn't very sure of my travel plans, and hence hadn't booked any tickets as well. 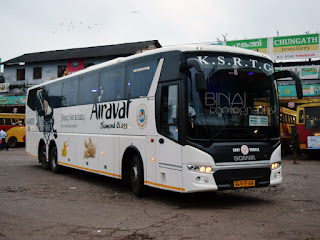 As the temptation grew, I booked my return ticket - on the good old Kerala SRTC Garuda Volvo B7R. Selecting the outbound was a bit confusing. I wanted to try the Luxura Sleeper, but the ticket was being sold on RedBus for some eye-popping rates. I wasn't keen on spending that kinda money for an overnight journey. I decided to check rates at their office and then make a call. I went to their office on a working day and asked for a ticket - the Madiwala office had to call up their main office to get details of seats. They asked my preferences and got a seat - it was an upper berth, while I would've been happier had it been a lower berth. The fare was about Rs. 600 less than what was put on RedBus!! I was booking a ticket through an agent after long long time now!! I was running a very high fever that day. I had a tough time sitting at office, and struggled to drive home. I hit the bed moments after I reached home, and slept without realizing anything. Luckily, I had left an alarm on my phone. I woke up when the fever reached its peak - the antipyretics I had taken did not have any effect, and I was still running a very high temperature. I called up home and had a word with my mom - who was of the opinion that I should come home, since that would be better than staying all alone in Bangalore. My brother agreed to pick me from Thrissur. I vaguely remember disconnecting the call and falling asleep again. I woke up when the alarm went off. It was struggle to stay awake, and my legs were paining badly (the typical Viral Fever symptoms). I called up a local taxi operator and arranged for a taxi to drop me at Madiwala. The cab turned up at 7.30pm (8pm was my reporting time). I struggled to walk to the taxi from my home due to the fever. I got into the cab, and he dropped me at Madiwala just past 8pm - the fare was same as an auto! I felt Taxis are a better choice as compared to an Auto, especially for the price I paid. I met my friend, Deepak (DJ) there - we chatted for some time. The bus turned up at 2015hrs, but boarding did not commence. I showed my ticket at the office, and they asked me to wait - they bus was being prepared it seems. Boarding started at around 2025hrs - I got into the bus and got my boarding pass. Headed straight to my berth, "U6". I had to search around to get some place to leave my luggage. I got on to the berth straightaway - I was tired to do any busfanning or even stand and talk. The engine was running, and the AC was set to very comfortable temperatures. This was my first ride in a Leyland Luxura Sleeper. The bus has a 12M RE Chassis from Leyland, powered by a 225HP CRS engine. The body is built by Azad. The bus has 32 berths, in 2+1 layout. The interiors were classy - it was well put, and looked good. The berths had fabric upholstery with integrated pillows. Blankets were provided, but no bedsheets - the maintenance is surely set to be a nightmare. Each berth had two AC Vents - one adjustable, and one non-adjustable. Reading lights were provided for each berth, and there was a metal rack, big enough to hold handbags. Air ducts were intruding into the leg space in the upperberth. The gangway was well lit with LED lamps, that looked far better than the el cheapo fixtures used by Prakash. There was a good night lamp as well. 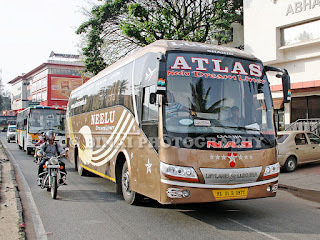 Atlas Travels is not really known for timely departures - this trip was no different. The people at the office were taking their sweet time to load parcels and also issue boarding passes. There seemed to be some issues with bookings as well. We were almost full as the bus started off at 2102hrs, a good 47 minutes late. The engine made some noise as it started off. The bus picked speed in no time - the gear changes weren't felt inside. The engine got loud at higher speeds, but wasn't as uncomfortably loud as a B9R. We took the BETL, and the driver maintained good speeds through the run. We stopped for a pick up at Bommasandra, at 2140hrs. About 3 passengers got in, and we got moving at 2143hrs. I fell asleep even before we crossed the border - it was more of a sedation than actually sleeping. My legs were aching badly that I kept waking up time-and-again. I woke up when the driver hit a sudden brake - I am very sensitive to "stops" when traveling in a bus. This was one real sudden break. The bus stopped on the road side then - I thought it was a leak break, since I saw a few people getting off the bus. I slept off even before the bus started moving. The ride was really comfortable, that I did not know anything - not even the flyover at Salem! I woke up in better, and we were passing Kumarapalayam toll - the bus was running very slow at this point. I did not check the time, but fell asleep again. I was woken up by the Attendant, at around 0414hrs - I was wondering if we reached Thrissur already - but the reason was different. The attendant said we had to change buses - Change buses? Why? I was feeling better now - the fever had subsided, but was in a hangover. I got off the berth, gathered by belongings and walked towards the front. I was shocked by what I saw - the front windshield was shattered - in fact, it had caved in. The entire left side of the front was damaged - the door couldn't open fully, leaving a half open gap for passengers to get off. The exchange ceremony at Uthukuli. The bus on the left was the first bus, the one which crashed. Oh! When did we crash? I had a word with the driver, and he replied that the crash was just past Hosur! None of the passengers in the bus (except one guy, who was sitting in the cabin at the time of the crash) knew that we had an accident! The retarder did a really good job in this bus - I loved the ride comfort of this one. The replacement bus was waiting for us already - that was another Luxura sleeper (the pairing bus). The attendant were helping passengers with the luggages, and also shifting parcels. The drivers had a word with each other. The driver of the replacement bus headed for a tea, while the attendants exchanged the passenger manifests and our original bus departed back to Bangalore. I switched on my GPS to get an idea of where we were - I understood that we were at Uthukuli, a place near Tiruppur. We started off at 0433hrs. The driver was rash from the word go - he picked speed rapidly, and I guess he wanted to make up some lost time. I updated my brother about the delay, and told him to leave home only after I call him. I slept again, even as the driver kept going fast. 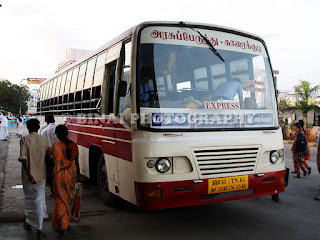 I remember seeing the bus stopped by the Traffic Highway Patrol - we were at one of the toll booths on the Coimbatore bypass - I guess the time was around 0530~0545. 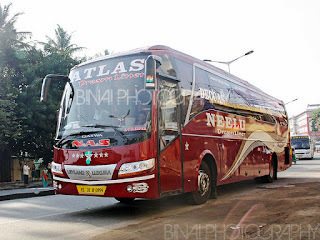 I woke up only when the attendant came around calling for passengers alighting at Palakkad. The bus stopped at Palakkad Chandranagar bypass junction, at 0632hrs. The bus then took the route through the town, and headed towards Ottapalam. The driver was quick on this route - he did not bother the curves much, but the bus had a very matured ride. The body roll was under control - it kept tumbling me side to side like a washing machine. I slept for some more time, and woke up as the attendant came calling "Ottapalam". We reached Ottapalam at 0706hrs, dropped a passenger and continued. I called up home as we left Ottapalam, and asked my brother to start after a few minutes. We stopped for a drop at Shoranur again, at 0719hrs. I got up now - sitting on the berth was a bit tight - the headroom was limited. There was a good backrest, so sitting was not very painful. I loved sitting with my legs fully stretched, and watching the world flypast. I loved the upper berth ride a lot. The bus finally rolled into Thrissur, Aswini Junction, at 0758hrs. I thought we’d proceed towards the round, but the attendant repeatedly called out “Thrissur”. I got off the berth and rushed to the cabin to ask if he’d go towards the round – the driver apologised and said he is very late and he is heading straight to Mannuthy – he offered to drop me anywhere if my destination was on that route. I thanked him for that courtesy, and got off the bus. I wanted to take a picture, but since I was the last passenger to get off, the bus started seconds after I get off. I called up my brother, and told him to wait near Sakthan Stand since it would take him a lot of time to reach Aswini junction, wading through the morning traffic. I was planning to take an auto, but there were none around. I walked a little forward, and reached a bus stop. Just as I reached, a private limited stop bus rolled in - did not think twice as I got into the bus. Luckily, I got a seat immediately and rested. I was still tired with the hangover of the fever. I was dropped outside Sakthan stand in about 10 minutes, after rolling through Thrissur round, and past Municipal office. My brother reached a couple of minutes after I reached there. I was dead tired already. 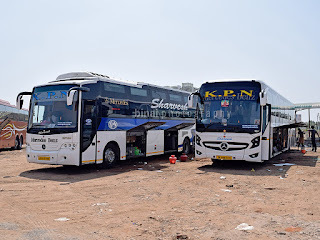 End Remarks: The first bus was NL-01-B-0877, with about 60,000kms on the odo, while the replacement bus was NL-01-B-0899, with about 46,000kms on the odo. 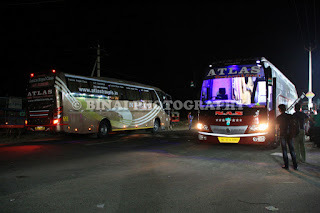 Both the buses were kept really well. There were no rattles from the bus. Azad has done a really good job at building the sleeper - sound and heat insulation was just perfect (I felt a bit of heat coming in, in the second bus though). I liked the ride quality a lot - being on the upper berth came with a bit of body roll, which was expected. The AC was amazing - the temperature was controlled well throughout. They had provided a full sized blanket, which made my journey comfortable. The bus came with excellent retarder brakes - even after a heavy crash, nobody in the bus realized what happened! The end-to-end running time came out of 10h56m - that included time to change buses, and the slow run from Hosur to Uthukuli. I was anyways expecting a 9~9.5hr running time, since it was lower powered engine. Will I take this service again? I am really keen to try this service again. I'd recommend this bus to anybody. By the way, booking through 3rd party sites is better now considering the "Flight" like charges of Private Buses-I got a good Rs.200 off in my travel yesterday in Viji Yathra. That bus also had a broken front glass! The ride was one of the laziest but speedy I have ever seen-Wasted 35 minutes at Madiwala for loading parcels-Departed at 21.05. Again wasted time (~15 min) at Hosur outer simply for leisure break & went under Hosur Flyover to call passengers like a normal bus! Lost time at Sulur also. But they reached Mannuthy at 04.55. From there they took 1 hr 20 min to Vytila driving very cautiously at 80Kmh. All the 3 drivers said that they had paid fines for driving in 3 Digits!